Translated.net is here in Seattle demoing a new plugin that extends popular CAT (computer aided translation) tools so that translators can work effectively as teams, and use a shared pool of translation memory and machine translation services. First it looks in the local translation memory for the current project (if there is a match, it will generally better than other options). Then it looks in a shared translation memory across projects within an organization. 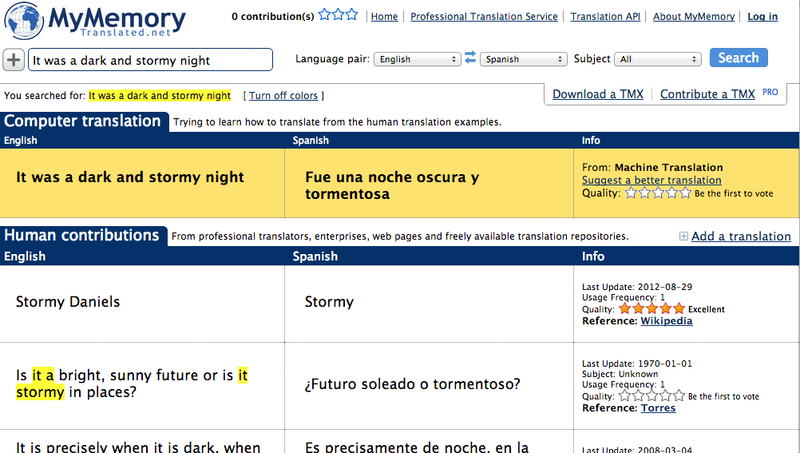 Then it looks to a global translation memory, shared across all users (with over 1 billion words captured in six months). If it has no luck with this search, it then goes to a domain specific machine translation engine, and if all else fails, goes to a generic translation engine. The MyMemory interface aggregates machine and human edited translations from many sources, and encourages users to edit and curate them as a community. As translators select and post-edit recommended machine translations, the system learns which engines are generating the best output for different tasks and language pairs. The amount of effort put into post-editing translations is a good mechanical way to measure quality (more time and effort spent fixing a translation = lower quality). This entry was posted in crowd translation, translation community, translation memory, Uncategorized and tagged memory, mymemory, tm, translated.net, translation. Bookmark the permalink.